"Since I did not have a sister and my own children are sons, I am always asking my wife, Carole, to tell me what she did in her youth. Carole loved to skip rope. She tells me how the sound of the rope was almost hypnotic as it hit the ground. My friends and I wouldn't have been caught dead jumping rope. Somehow that was something 'only girls did.' But I must confess. There were times, when nobody else was around and I had a length of rope, I too, would succumb to the hypnotic lure of that sound. As my feet left the ground I would find myself counting, 'One, two, three...' until I would trip up, look hastily around and hope that no one saw me." 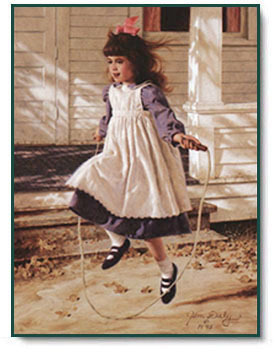 Skipping Rope copyright © 1995 by Jim Daly.